What an exquisitely crafted piece Hans Gál's Fourth Symphony is. The work succeeds against all the odds, facing down a range of problems from outright anachronism to a major crisis of generic identity. The subtitle "Sinfonia concertante" suggests the main title may be simplistic, and indeed four instrumentalists are promoted to starring roles in the music. Another complication is work's continual recourse to chamber music textures, all of which are very beautiful and delicate, but rarely symphonic. As for the anachronism, the symphony was written in 1974, a time which cared little for neo-Romantic or even neo-Classical music when written without irony. But Gál overcomes, or possibly ignores these many problems and writes a work that succeeds splendidly on its own terms. The music is civilised and contained, but never dry. It is contrapuntal but not overtly intellectual. And although its instrumental forces are limited, every player is put to good use. Gál never seems quite as committed to the concertante idea as his subtitle suggests. He claims to set the solo instruments – violin, cello, flute and clarinet – in competition with each other in the first movement and then to set soloists against ensemble through the remainder of the work. But for most of the work, the wind players in the orchestra are treated in almost as soloistic terms as the actual soloists, and whether Gál is writing for the solo group or the orchestra, the relationships between the tone colours of strings and winds are always more important than those of soloist and ensemble. Kenneth Woods now has a great deal of experience in handling the music of this proficient but always understated composer, and the symphony is given a thoroughly convincing performance. Gál occasionally strives for a more dramatic level of musical discourse, for instance in the punchy codas to the outer movements. But in an otherwise chamber music setting, these outbursts could easily seem excessive. Woods' approach is to increase the dynamics as Gál indicates, but to keep the tempos steady, thereby retaining the Classical sense of balance and order. Lightness is another cardinal virtue in this music, especially in the inner movements, and Woods is able to keep the discourse engaging without ever leaning too heavily on the accents, or hinting at musical pedantry of any sort. The solo group, David Le Page, Christopher Allan, Diane Clark and Sally Harrop are all similarly attuned to Gál's sophisticated but understated aesthetic. All four are able to walk the fine line between soloist and chamber musician that the music requires. The couplings on this cycle seem to have occasioned more controversy than Gál's music itself. Schumann's Second is certainly a strange choice, the most Classical of Gál's symphonies presented with the most Romantic of Schumann's. And Woods gives the Schumann a highly Romantic reading, as if to accentuate the differences between the two works. Nevertheless, this is another fine performance, never going to any interpretive extremes, but still finding an impressively contemporary feel. All repeats are observed, as are all dynamics, articulations and tempo indications. Woods makes no concessions to the first violins in his choice of tempo for the scherzo, but they cope magnificently. And the later antiphonal sections are enhanced by the placing of the seconds on the right. In fact the stereo separation on the recoding is quite extreme, which helps to pick out the soloists in the Gál. The rits in the second movement of the Schumann are exaggerated a little too much for my taste, and the third movement adagio is just a little too understated. But all is redeemed in the finale, which is lively and energetic while always carefully controlled. 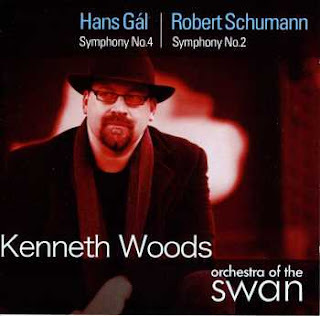 Another triumph then for Kenneth Woods and the Orchestra of the Swan. The conductor's celebrity seems to have increased significantly over the course of this cycle. The packing for this disc includes six images of him, and his name on the cover appears in a larger font than those of the orchestra or either composer. On the evidence of the recording itself, that status is well deserved. And he's clearly on the same musical wavelength as this fine orchestra, so expect great things from their future recording projects together.